US Treasury securities are doing something that is worrying a lot of folks, including Fed Chair Janet Yellen: While short-term yields are rising in line with the Fed’s hikes of its target range for the federal funds rate, longer-term yield have done the opposite: they’ve been declining. This has flattened the “yield curve” to a level not seen since before the Financial Crisis. 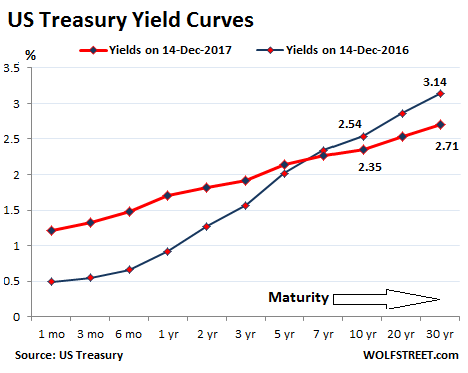 When long term yields fall below shorter term yields, the curve becomes “inverted.” This has been a reliable predictor of a recession or worse. And we’re getting closer. Today, the 10-year yield closed at just 0.53 percentage points above the two-year yield. This is the narrowest spread since August 2007. An inverted yield curve these days doesn’t necessarily cause a recession, she said. An inverted yield curve is itself a product of various factors. And one of those factors is heavy buying of long-dated US Treasuries by investors in countries on which central banks have inflicted their negative-interest-rate policies – the ravaged NIRP refugees hailing from Europe and Japan. There are a lot of them, and they’re having an increasingly large problem that is only going to get worse next year – regardless of what the ECB will or will not do. Fitch Ratings estimates that the total amount of global negative-yielding government debt is $9.7 trillion, with Japanese government debt accounting for $5.8 trillion and European government debt for $3.9 trillion. While the ECB has tapered its QE program from €80 billion a month to €60 billion a month in April and has announced further tapering to €30 billion a month starting in January, it has acquired a volume of government bonds equivalent to 3.5 times the net issuance on average in 2016 and 2017, according to Fitch. [This is] forcing holders of Eurozone debt to purchase other assets, such as US treasury securities. While long-term yields in the US remain low, they remain well above core Eurozone yields that are near their 2017 lows. With the US Treasury 10-year yield at 2.34% today and the German “Bund” 10-year yield at 0.32%, the spread between them is a juicy 202 basis points. And this is going to be a problem for institutional investors with large positions in medium and longer-term European sovereign debt, such as pension funds and insurers that hold bonds to maturity. Maturing securities will continue to be reinvested in securities with little to no coupon income in Europe and Japan, hurting investment income and increasing duration risk, all else equal. In Germany, a bond originally with 10 years to maturity will come due in January 2018 with a coupon of 4%. If reissued, with a coupon at current market rates, the German bond will have a coupon of around 30bps [0.3%]. A large pile of bonds is maturing, all with significantly higher coupon payments than are available today. They will be replaced with near-zero or below-zero yielding bonds to produce a significant loss of income for those investors, unless they seek refuge in the relatively attractive longer-term yields available in the US market. Thus, these NIRP refugees in Europe and Japan are piling into the US market, gobbling up longer-term Treasury securities, driving up their prices, and thereby pushing down yields, which “has likely contributed to a rapidly flattening yield curve in the US,” Fitch said. The Fed continues with its gradual rate hikes, which impacts short-term rates. It has also gingerly commenced its QE unwind, which should push up longer-term yields, but Fitch says, “demand from yield-hungry investors overseas” has so far overwhelmed the Fed’s QE unwind. With short-term yields rising and longer-term yields stuck at low levels, the yield curve has flattened, and the spread between the two-year and the 10-year yield has narrowed to levels not seen since before the Financial Crisis. And this phenomenon is occurring “despite the fact that US GDP growth has exhibited strong momentum and outperformance in 2017, similar to the Eurozone,” Fitch says. So neither Fitch nor Yellen see the flattening yield curve as an ominous sign of anything other than exasperated NIRP refugees looking for a somewhat less gruesome alternative. And folks hoping the Fed will use the flattening yield curve as an excuse to back off from further rate hikes will likely be disappointed. Yellen should take advantage of this and accelerate the Feds unwind of its balance sheet while there is this demand. Dump MBS if there are buyers, by all means, why dump High coupon Treasury’s before maturity ? Throwing return away. Return that after expenses, ends up back in Treasury. Also as stated by other’s, it isnt her call anymore. They could let ALL maturing securities roll off. That would be a huge move every month. Currently they’re replacing most maturing securities except for $10 billion a month (the “cap”). If they removed the “cap,” their balance sheet would drain very quickly. The goose has already been cooked. If Fed unwinds the portfolio as fast as they constructed it, Mr. Market would not be amused and the entire “recovery” story would be exposed for the lie that it is. For some insight into why those MBS securities aren’t being sold off, it helps to understand that the Emperor has no clothes. The System would probably react negatively to such action. Should “Inflation” (As determined by the FED) run up. Dumping large Amounts or all of both is a option before raising rates aggressively. The Fed is however stuck with the “Easing” by other institutions. Along with the continuous chinese used toilet paper printing mill. I wounder what % of the liquidity holding up the US Stock’s, comes from the same source. it would be great for the balance sheet, if the fed unwinds at full speed but the resulting interest rise would not amuse mr. & mrs. taxpayer. let’s not forget that as rates rise so does the deficit – exponentially. If interest rates are heading lower its a buyers market and since the Fed announcement the buyers are piling in, (ten year down nearly as much as the puny 1/4 point rate hike). Dumping more paper is pouring gas on the fire. So far the rate hike plan is inflicting immediate pain on low end US consumers, and nothing for depositors, since the interest never arrives, while it is meant to send a message to hot capital. She has spent considerable capital building up the banking industries stress levels, now she looks like the proverbial fool raising short term rates while long bond yield fall an equal amount. What about the banks their stress test levels are what all this post 2008 policy was about, now the hot money is destroying the yield curve, and profits? The political manna is more deficit spending, done and done. Hot capital monetizes corrupt US fiscal policy and you will never have to pay taxes again. Also agree. Powell could state it’s a good reason because gains could be made on some of the bonds it holds if sold that way and it provides a clean balance sheet for future possible needs. The markets would love it if properly described this way. There’s no reason the Fed couldn’t have a ‘sale’ on money with a future QE if there was a severe liquidity crisis someday. A 9 year sale on money followed by a very slow unwind is a symptom of corruption posing as monetary policy. Why the euro is getting stronger then? It should be pushed back below 1.1 against the euro if this carries on. It doesn’t make sense to me. I have the same question. Is it possible that frontrunning the ECB QE (bond purchases) is more profitable than even getting 1.25% short term interest rate in the US?? The justification you usually hear is that due to Europe’s “stronger than expected economic growth” the euro is strengthening. Why we are not told and with good reason, because it’s one of the laziest explanations in monetary history. If that were the case, we’d have been buying yuan hand over fist for years now. A big part of the reason however is neither the Fed nor the ECB. Since last year the People’s Bank of China (PBOC) has been aggressively selling large amounts of US dollars to prop up a faltering yuan on offshore markets (which the Party does not and cannot control) but, here’s the kicker, foreign exchange reserves have only dropped slightly since, going from US $3.012 trillion (2016) to US $2.989 trillion (2017 estimate). The exact composition of these Chinese foreign exchange reserves is a State secret, as are the transactions, but the PBOC is known to hold only four foreign currencies: US dollars, euro, GB pounds and yen. Has China been selling dollars and buying euro? We cannot know and most likely we’ll never know but it’s extremely likely. And while the Banque Nationale Suisse (BNS) has nowhere near the amazing firepower of the PBOC (foreign-exchange reserves at the end of the 2016 stood at CHF 747 billion, pocket change compared to China), their present holdings are 40% euro and 35% US dollars, with the rest mostly composed of yen, yuan and, intriguingly enough, Canadian dollars (3% of the total). Despite having removed the untenable peg, the BNS has never made a mystery of their aims to keep the CHF as weak as possible against the euro to prop exports up: always remember relative to her size Switzerland is as big an exporting power as Japan, Germany or South Korea. Central banks with large foreign currency reserves are the only players with enough financial firepower to account for sustained movements in mega-reserve currencies such as the US dollar, the euro and the yen. That’s where one should look for an explanation of this phenomenon. 2018 could be a wild ride. Society slouching into inflationary mediocrity – hardly a crazy roller coaster. More like a boring ride on It’s-a-Small-World ride at Disneyland. I think the fun starts in a couple years when inflation gets out control. Powell will be like a dear in the headlights, he is about to take the fall for Bernanke and Yellen but he deserves what’s coming to him, he never cast one dissenting vote to any of this madness. Not until late into the year when the Fed’s QE unwind will jump to $50 billion/month, a whole lot of money, and the battle between hawks and doves at the ECB over Draghi’s successor will be resolved. If Weissman and the hawks win out, expect ECB policies to radically change, gradually but steadily. However the big question mark is China. What made her so special, the fact her economy was remarkably “debt-efficient”, is long gone, even by using official statistics. In 2017 China has so far accumulated more debt than the US, the EU and Japan combined and will report the usual 6+% economic growth only gullible Westerners believe in. Most of that debt is of highly questionable quality, especially given the Chinese government doesn’t like foreigners to poke their noses around their financial secrets and routinely regales us with fanciful numbers even local authorities disregard as cheap propaganda and smoke screens. But the real issue with China is overcapacity in every single sector, from to toy soldiers to wind turbines. In spite of all the usual propaganda Chinese authorities aren’t in a hurry to curb that overcapacity, which is getting exported all over a world already swimming in overcapacity. For me that overcapacity and especially its influence on the rest of the world economy and China’s immense debt pile is ne of the three things to keep closely monitored, the other two being the commercial real estate market (not just in the US) and stagnating/contracting real wages all over the West. The three factors are deeply intertwined and each one will need to be tackled over the next decade to avoid structural issues that may reverberate for decades across the world economy. thank you mco1. your posting explains alot. and thank you wolf, your articles are always highly informative. this one really helped answer my questions. And just imagine if we enter deflation and all those bonds paying 2.5 percent can only be redeemed by paying dollars worth MORE in real terms. In other words, the interest would be gravy, you would make money in real purchasing power if you got no interest. I note that most commentary is concerned with asset inflation. It is a concern,especially when it affects living space. Apparently running a very distant second is that the national debt is not a fiction. Millions of US retirees depend on the interest on that debt to live on. Many in the US (and Canada) look at Greece and think: they shouldn’t haven’t borrowed so much money. And to those who say ‘we can print US$’ to cover all foreign debts. US pensions are owed in US dollars. So why do you think that most people do not see deflation as a possibility? Actually to me it is a real probable consequence to overly indebtedness. Inflating the money supply, if it resulted in price inflation, would just reduce the ability to pay the existing debts. Especially when you consider that 70% of the US economy is consumption by consumers who have exceedingly extended themselves beyond any rational ability to repay. Not all of them but when looking at the averages and the amount of CC and mortgage debt, it sure wouldn’t take much to set the dominoes toppling again. Just a little rise in the interest rate could easily start it and with the Trump Tax Plan adding to the US government’s demand for more loans? And the FED both starting to unwind and raise at the same time? That GDP growth includes the Ponzi financial asset inflation caused by bond purchasing. Solution? Loosen restrictions on purchasers who are required to purchase so- called safe investments like government bonds. That’s what will happen, because of need for yield. Then central banks can concentrate on buying government debt. It is what Republicans have been begging for for years, considering the policy behind constraining investments is simply a social welfare policy. So give them welfare–and free the money. And the result will be a fully monetized economy, until the true weakness of the economy causes a cascade of debt defaults. Just like the 1920s, when cheap debt masked a terribly weak economy–for a while. And the U.S. economy is extremely weak, driven by terrible demographics. Let’s just make the U.S. a state of India. All roads lead to inflation. We have neither the ability nor the conviction to pay back what has been borrowed – better to pay it all back with printed dollars than to hand over a percentage of our hard earned income. Why pay for something when you can have it for free? The U.S. government is increasing spending on all the goodies (who doesn’t like more fighter jets and missiles – cool!) while cutting revenues – why pay for stuff when we can get everything free through the magic of debt and inflation? Note to politicians: keep giving us free stuff and we will keep voting for you (as if they didn’t already know). We live in a truly golden era. Will be interesting to see how things will turn out. One thing that I am wondering about, have the central banks QE etc altered basic rules, have they managed to break the system or what ? Yes. It is the abandonment of the idea that banks are actually capitalist and have to face the consequences of their actions. – NIRP is NOT a “policy”. It’s done by a force called “Mr. Market”. The ECB has set a negative deposit rate, currently -0.4%. That’s part of its much publicized monetary policy. That’s why its monetary policy is called Negative Interest Rate Policy, or NIRP. QE is also part of its monetary policy. And there are various “monetary transmission mechanisms,” the ECB calls it, by which its monetary policy has become the dominating power in the market. That’s why many government bonds in Europe have a negative yield. The Bank of Japan, with its massive JGB purchases, along with the government institutions and their massive JGB holdings totally control the JGB market all the way up the yield curve (“Yield Curve Targeting” is what the BOJ calls this), and they totally strangled the market, yes, they strangled your “Mr. Market,” and his corpse is lying out in the back. You’re right in one way. Corruption is also Mr. Market, and the middle class is in on it, every step of the way. In the end, blame the people. This corruption pays their salaries, and they approve it. Down they go. Who will mourn the deaths of a bunch of corrupt slobs? That’s like saying being robbed and beaten on the street or having your account emptied by thieves is thriving robust capitalism. We’re supposed to have laws which are supposed to be enforced so that all benefits and wealth is maximized. We have the laws. Corruption is unfortunately something that’s in the eye of the beholder. If policy setters embrace corruption, it’s called official policy. Simply change the laws to make corrupt behavior legal. That way you don’t have to worry about breaking any laws. Think about who writes the laws in the U.S. – lobbyists. Lobbyist lawyers literally write our laws. There is no reason corrupt wealthy elites should ever have to break the law when changing the law is easier. Prior to the 1980’s it was illegal for companies to buy back their own stock because doing so is stock manipulation that benefits corporate officers who have been granted stock options. No need to violate stock manipulation laws – simply change the law – problem solved. The electorate doesn’t seem to be mind allowing corrupt lobbyist write our laws – you get the corruption you deserve. Unfortunately, the overwhelming majority of the electorate votes for either flip side of the two-party duopoly, and yes, they get the corruption they deserve. The 2014 Cromnibus Bill was essentially written by Citigroup to put trillions of dollars of derivatives: “Hedging and other similar risk mitigating activities directly related to the covered depository institution’s activities.” i.e. the taxpayers are on the hook for Wall Street’s gambling. Yellen is wrong about curve inversions not causing recessions. When leverage is ubiquitous, pervasive and 100% necessary to keep trillions in debt dissolved in markets a loss of carry due to inversion is catastrophic. That was the real lesson of 2007. There’s still plenty of carry if you borrow German and loan American. Which is what Yellen is on about. I get what you’re saying, but since the flattening cannot be solely attributed to organic economic forces perhaps an inversion will not at all be indicative of our failing economic health here in the US or the harbinger of doom it once was. I have far more concern about the effect on markets when management misuse (IMHO) free cash and low cost borrowing to do share buy backs. Boeing is up 100%ish since January 1 and just announced another share buyback at these inflated prices. How long does that financial engineering work? The yield curve doesn’t mean anything anymore. Central banks determine the yields. With yields dictated by central planners their is no free market predicting anything – much less a recession. When you remove the free market from the equation don’t expect to use the free market as an indicator of anything – it simply no longer exists. Central banks don’t control the yield curve. The Fed sets the Fed Funds Rate which influences the cost of short duration US debt. The bond market still determines yields at the intermediate and long ends of the curve. (I’m not counting the pittance of a sale the Fed makes into the market monthly as part of unwinding the balance sheet). The bond market sees a future of continued low growth and low inflation, hence 2.4% on the 10 year is the price the market has set. Should the Fed hike the FFR more than 50 basis points or so, lending would be severely crimped and a recession would soon follow. Deny the power of the yield curve to predict recession at your own peril. When the 10 year minus 3 month spread inverts and high yield spreads start widening, that’s the last, last warning. You need to be out, 100%, and it’s probably already too late to miss the first big move down. But until then, stocks are going to keep powering higher. The Fed and other central banks did, in fact, buy a boat load of treasuries and mortgages at inflated prices – the purpose of quantitative easing. How can you claim the Fed (and the rest) don’t manipulate the yield curve? What are you talking about? If a central bank creates money to buy an asset with the expressed purpose of inflating the price of the asset… – that constitutes manipulation, yes? How can you claim central banks don’t manipulate the yield curve? Bernanke, in fact, boasted about manipulating asset prices – astounding! The guy should be in prison. NIRP refugees holding down the long-term interest rates in the US is an interesting hypothesis…..but wouldn’t foreigners buying US treasuries put upward pressure on the US dollar? China and Various other “Entities” have been Issuing Debt. In a big way. Taking any Desirable (to them) currency for it. This reduces the Official FX demand for $. For the PBOC, this is just as effective, as suppressing CNY. This Indirect US $ Demand suppression, will at some point Unwind. Possibly aggressively. I think that it is EXTREMELY important to carefully keep in mind the legal underpinnings and ther official, stated purpose of the full-blown, on-going economic experiment in which we now live. Fortunately, for most incredibly long, jargon-filled legislation, the first parts of those “acts” are amazingly simple, so here we go with the simple part, with my capitalization of the words that I think are important. I find several details in the above abstract of our unprecedented, on-going experiment quite interesting. First and foremost, what exactly IS “the economy and financial system”? Shouldn’t “we, the people” know WHAT “the secretary of the treasury” is about to prevent from becoming, presumably, unstable? What “sucker” was the Great Bush talking about? Again, what was economic and “financial system” that was becoming destabilized had, therefore, had to be “stabilized” (“subsidized” would have been much more accurate) at a cost to future taxpayers of at the very least $700 billion dollars (which turned out to be several trillion “dollars”, and counting)? What was being stabilized/bailed-out/ rescued was an economic system in which the vast majority of wealth and capital is owned by a microscopic percentage of the population. That microscopic percentage was about to take an astronomical loss on much of their investments and they had to do “whatever it took” to prevent that from happening. Of course Bush (as well as the teleprompter-virtuoso that marched exactly in his footsteps to finally sink the Elite’s bi-partisan putt in the empty holes in the heads in Congress) could not state that poltically-unpalatable truth — essentially, that future taxpayers had to be literally robbed blind to keep the Elite the Elite. Second, notice the goals mentioned in 2 A, B, C and D. Which of those goals do you think have been met since TARP became the law of the world? In particular, does anyone think that section 2D — “provides public accountability for the exercise of such authority” — is being met? Is this “accountability” (whatever the hell that means) being kept a big secret for our own good and, if so, why? Can’t we handle the truth, or might the public knowing the truth bring this experimental sucker down? “SEC. 112. COORDINATION WITH FOREIGN AUTHORITIES AND CENTRAL BANKS. Just exactly how much of this unprecedented, completely-experimental “coordination” between “foreign financial authorities and central banks” is taking place this very day? What exactly IS a “financial authority”? Yes, folks, we now live in a truly experimental economic/financial/POLITICAL system. Unfortunately, it is one that also requires 2B — presumably perpetual “economic growth” — AND, never-mentioned-anywhere, perpetual war. Very unfortunately for all human beings, we live on a planet that ALREADY has 7.6 BILLION people and SEVERAL (and increasing) highly industrialized, nuclear-powered nations. Humanity will not be able to keep on future-taxpayer-funded life-support a “system” in which a microscopic percentage of the population owns the vast majority of wealth and capital equipment that will, by its fatally-flawed design, REQUIRE perpetual growth in the human population as well as perpetual war which will certainly become waged with nuclear weapons. Janet Yellen is not worried, if she were, she would reverse operation Twist. Otherwise, it will take 20 or 30 years for long term Treasuries to “roll” off the Fed’s balance sheet. According to the Fed’s plan, by October 2018, up to $50 billion in securities will be allowed to roll off per month. That’s $600 billion in 12 months. At that rate, it would take four years to knock $2.4 trillion off the balance sheet. They won’t go further anyway. I have no idea how that myth started that it will take 20-30 years. Since when do the Fed’s plans mean anything? The Fed’s QE plan, under Bernanke, was to buy as much as $1 trillion (wow!!!!!) of treasuries to stabilize the monetary system and then reduce the balance sheet after the crisis passed. Under that plan the balance sheet is $800 billion (or slightly more to account for a growing economy). The Fed’s plan was to lower interest rates to a negative real rate long enough to pull us out of recession. How did that plan work out? Are we in a recession? Are real short rates positive? Don’t think so. Members of the Fed are nothing if not compulsive liars. Are we supposed to start believing them now? I lost out on a lot of money by taking the Fed at their word in the past – not making that mistake any more. They are lying, they are not going to tighten. This time the lie is obvious, unlike in the past, because tightening is no longer possible. That moment came and went – it met with pure cowardice. It is precisely this kinds of widespread belief that keeps the Fed on track. It’s going to keep unwinding QE and raising rates until people believe that it is doing what it said it would do. This is called “credibility.” The Fed squandered whatever credibility it had. And now it’s trying to regain it. Credibility is part of the monetary transmission mechanism. It’s going to take people a long time to believe that the Fed will do what it said it would do. So the QE unwind and the rate hikes are going to continue until the Fed regained credibility. I think even the average working person who knows next to nothing even knows it. The FED is just posturing and will lower not raise interest rates. It has been raising rates like clockwork, exactly as it said it would a year ago. Since late last year, it hasn’t missed a beat. Wolf says – “So the QE unwind and the rate hikes are going to continue until the Fed regained credibility.” In other words, until Mr. Market throws a hissy fit and declines. Then what? Fed regains “credibility” and furiously eases. And we’re right back to no credibility. The Fed WANTS markets to decline, and it WANTS volatility, because it will blow off some risks. But it doesn’t want a crash that will freeze up credit. So unless credit freezes up as it did during the Financial Crisis, and unless it gets really ugly, the Fed will likely not step in. That’s how I’m reading it. Implodes ,well different issue that “Might” need some action. Remember FED now sees Overvaluation in Some stock’s. I think it started with the notion that the Fed would roll Treasuries off their balance sheet once they mature. During operation Twist, the Fed exchanged short term Treasuries with longer term ones. How long does it take a 20 year Treasury to mature? 20 years. Translation: we destroyed the market, so don’t worry about some past indicators; there are none left. Ha ha, we might be in a deep doodoo, and we would not be any wiser. I sure have no clue. If she hikes the short end of the curve enough to invert it, and particularly if she inverts it deeply, we will be in a recession six quarters or less. End of story. If the Fed gets too nervous about an inverted yield curve, it can outright SELL $100 billion a month in Treasuries with long maturities, or even $300 billion a month, of the $2.45 trillion of Treasuries on its balance sheet, and it can dump MBS too — and watch long-term yields spike. The Fed never had this tool before. But now, if it wants to use this tool, it can. The mere announcement to that effect would shake up markets. Or the Fed could be more careful and just accelerate the ramp-up period. Instead of taking till Oct 2018 to reach the $50 billion a month, it might decide to get there by February, for example. That would probably get the long end off the ground very nicely. QE has ushered in a new era. We just haven’t seen all the aspects yet. That certainly won’t stop a recession if one is coming, but it will stop the yield curve from inverting. Well, a different view than that expressed last month with the Market Smells a Rat post for sure. What is the significance of the “Repo Fails” being reported in increasing numbers and greater sums of money?? Dollar Shortage is the fear narrative but I don’t understand it. I would like to sincerely thank the Europeans and Japanese. Long TLT and VGLT. Part of it, almost is. The difficulty with buying any sovereign bond denominated in a different currency is the projected exchange rate. You buy those US bonds, the dollar drops and when you redeem you lose your interest. LONGTERMCAPITAL, thought they would hedge the currency and take home 10% on those Russian bonds. What could go wrong? In this market its increasingly difficult to tell who is on the other side of the trade? Vix? Bitcoin? And if the PPT really wants to juice the market how about some phantom shorts? With some collusion nobody has to lose. Anytime there are asymmetric technologies at work, the man with a club will always lose to the man with a sword. My only concern is…how do we know whether or not there is “stealth” QE or buying going on? Example; when Saudi (I believe) was dumping treasuries, low and behold, the economic “powerhouse” that is Belgium stepped up and bought them (if memory serves me right). So, is this the ECB through the back door – you scratch my back, I’ll scratch yours kind of thing? How do we know this “unwind” isn’t all a shell game? I’m hoping Wolf can add some insight to my question. We truly live in weird and confusing times – which is the largely result of a gov’t outside of it’s true constitutional mission. Much flows from there. “Euroclear Bank, the leading International Central Securities Depository (ICSD), is your gateway to counterparties worldwide for post-trade services, covering more than 1 million securities,” it says. Via this massive Euroclear, Belgium is a major financial center and transit point for all kinds of assets. At the end of 2016, it held €22 trillion in assets, for over 2,000 global and local custodians, broker dealers, central banks, commercial and investment banks, investment managers, and supranational organizations in more than 90 countries. Every year, it settles over $780 trillion (with a “T”) in securities transactions for its clients. Would Euroclear be an entity where most major players have an escrow account to facilitate transactions? I naively assumed the primary dealers would be US domiciled banks, but was wrong; they are mostly US branches of global banks. That’s very good boilerplate, just not sure it covers all the possibilities. I am in the quid pro quo section, I see the Fed “arranging” for DB to offload derivatives to Citi and JPM, I see those banks fail their stress tests thereafter, then the unregistered derivatives become “registered” while the Fed is the ultimate fence to clear the title on murky securities. I see Janet ask for authority to buy a “broader range of assets”, not getting it the SNB starts buying the NYSE, assume there is a QPQ. That is “stealth QE” far far as I am concerned. I have watched speculative markets, and this is not one, money from thin air is being dumped into the global monetary system. Greenspan couldn’t (or wouldn’t) explain monetization when asked. but using the Fed as an intermediary was so 90’s. And next crisis who bails out the Fed? Relax, LOL! The FED specializes in inventing the future, it’s what they’re so well paid to do. Thank you Wolf – I enjoy your site a great deal. Trying to get some insight to help protect myself and my family in these times. I will look up those links you provided. As an immigrant to this country when I was 2 years old in the late 1950’s, my parents impressed upon me the importance of savings. I believe savings and the capital it provides are a very important part of a country’s fabric. Capital has a reasonable cost and savers should be treated fairly…1 or 2% is too low, while 10% is too high. How can the economy be proclaimed so “great” when we can’t pay savers? It does the younger generations a great disservice not to be encouraged and rewarded to save as this needs to be the foundation of any sane society. Buy a great bed and always get a good night sleep! (You are already far ahead of the rest of us transplants when you wake up!) The rest and exercise and simple living will pay for itself. Stay off the RAMEN and Gatorade save 10% each paycheck. Bankers love chairman who invert the yield curve! It seems the rig artists, crooks and shysters who backstop the U.S. equity markets are buying up bonds wholesale at the open almost every trading day. These are bonds no one on Earth wants as short term interest rates rise. This also tends to push short term yields higher.